Dr. Michlin has saved my life! Three weeks ago I was in the worst pain of my life, totally unable to walk, hardly able to even move. Today I am almost completely pain free and standing on my own two feet! 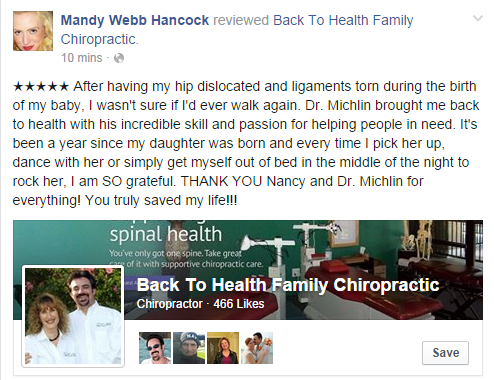 I can't thank Back to Health Family Chiropractic enough! The office is beautiful, warm and inviting. Nancy, Co-Owner, and Tina, Patient Coordinator, are so kind and welcoming! Dr. Michlin is the only chiropractor in North Texas who is a Board Certified Atlas Orthogonist, and let me tell you, IT WORKS!! !